Porsche Cars North America officially opened its new US$ 100-million Porsche Experience Centre (PEC) and headquarters in Atlanta, with the 27-acre complex becoming the brand's largest investment ever outside Germany. forward-thinking and performance-driven ethos, the industry-first facility is complete with a driver development track, classic car gallery, restoration centre, human performance centre, driving simulator lab and a fine dining restaurant. A state-of-the-art business centre features 13,000 square feet of conference and event space while the experience centre has been specifically designed as a destination for the public, automotive enthusiasts and Porsche customers. 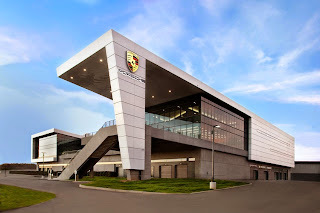 An estimated 30,000 guests are expected to visit the uniquely designed Porsche Experience Centre each year. Visitors and corporate groups can enhance their driving skills, utilise meeting space in the fully-equipped business centre, view classic Porsche automobiles or dine at Restaurant 356, aptly named after the first production Porsche. The 1.6-mile Driver Development Track runs through the courtyard of the facility and includes six instructor-led driving modules. The Handling Circuit, Off-Road Course, Dynamics Area, Low Friction Handling Circuit, Low Friction Circle and the only Kick Plate in North America are designed to demonstrate the engineering and technological capabilities of Porsche models.